During the early 1980s, many magazines and newspapers began to use digital imaging devices to manipulate photographs. The most popular such device was sold by Scitex America. The machines were very expensive, but they allowed images to be altered with far greater ease than darkroom techniques allowed. 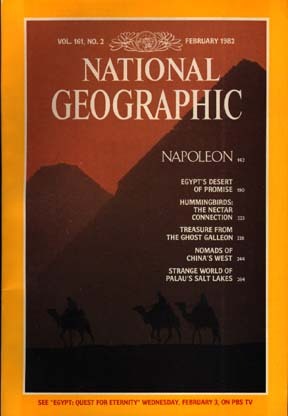 One of the earliest high-profile instances of digital photo alteration appeared on the February 1982 cover of National Geographic (top), which showed a camel train walking in front of the Pyramids of Giza. Readers weren't informed that the pyramids had been moved slightly closer together, in order to fit the vertical format of the cover. No one might have noticed if the photographer, Gordon Gahan, hadn't complained. It then became a source of major controversy. Sheila Reaves, a journalism professor at the University of Wisconsin has speculated that, "The enormity of moving such a large object brought home to people that you can move a shoulder or a smile." Less remarked upon was that the photo was also staged. The camel train had walked by while Gahan was setting up his equipment. He paid them to walk by again. Bottom: another shot of the pyramids from the same photo shoot by Gahan. In this photo, the pyramids haven't been moved.